Got a sweet tooth for cake and mobile games? 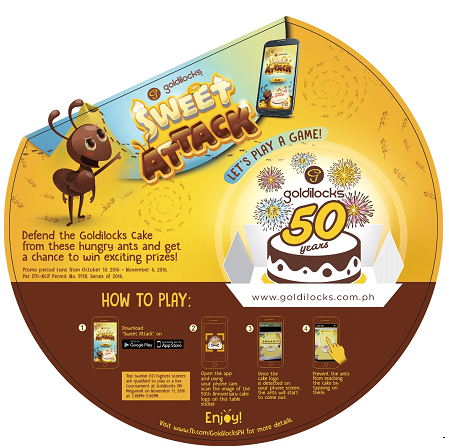 Goldilocks, the country’s number one bakeshop who has not only established themselves as a premier food establishment, has just penetrated the gaming market with their new gaming app named “Sweet Attack”! This app was created to celebrate Goldilocks’ 50th year anniversary by using revolutionary augmented reality software which makes use of your phone’s camera for an added gaming experience. The mechanics are simple: you somply need to download and open the app, click yes during the sign up prompt, fill in the necessary information, and you’re good to go! Scan the Goldilocks 50th Anniversary logo featured on in-store posters, which will then become an actual cake on your phone. You then need to defend your cake against ants that want to take a piece from it. The game is not only fun and addictive, it also gives you the opportunity to get Goldilocks’ rewards in real life based on your high score.